Ever wonder what kind of cactus you were looking at? The family of plants called "Cactaceae" includes an amazing array of shapes, sizes, and gorgeous, sometimes seductive, flowers. Even in this hot arid land, brilliant colors grace these spiney succulents. 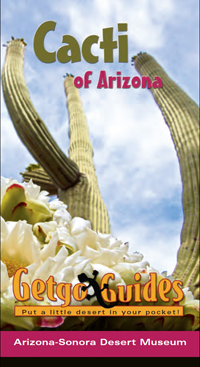 The Cacti of Arizona Getgo Guide, which easily fits in your pocket is perfect for a spring hike in the desert. It introduces non-botanists to species in a half-dozen groups of cacti — from columnar cacti like the giant saguaro to mammalarias like the little pincushion. You'll find pointers on how to tell them apart, when they flower, where they grow, and a miscellany of fascinating factoids. A great stocking stuffer or party favor for the hiker or amateur naturalist. A steal at $4.95.